Clark University officially has its own farm. There are no animals, no barn, not even soil. And yet it will supply a steady harvest of crops regardless of the season. On Jan. 15, the University received delivery of a Freight Farm — a retrofitted shipping container housing a fully functional hydroponic farm known as the Leafy Green Machine. Parked behind the Lasry Center for Bioscience, the Freight Farm will provide Clark’s Dining Services with fresh lettuce — as many as 500 heads a week during peak times — 365 days a year, whether there’s two feet of snow on the ground or the thermometer is hitting three digits. Inside the climate-controlled Freight Farm, which will be operational in a couple of weeks, are rows of “growing towers” in which seedlings are bathed in LED lighting that mimics sunlight and irrigated with nutrient-rich water. As many as 4,500 plants within the 320-square-foot trailer can be maintained and monitored remotely through a mobile app, deploying modern technology to the ancient art of cultivating food. It’s agronomy for a new age. Technically, this is not the first time a Leafy Green Machine has found a home on campus. CEO and co-founder Brad McNamara, M.B.A./M.S. 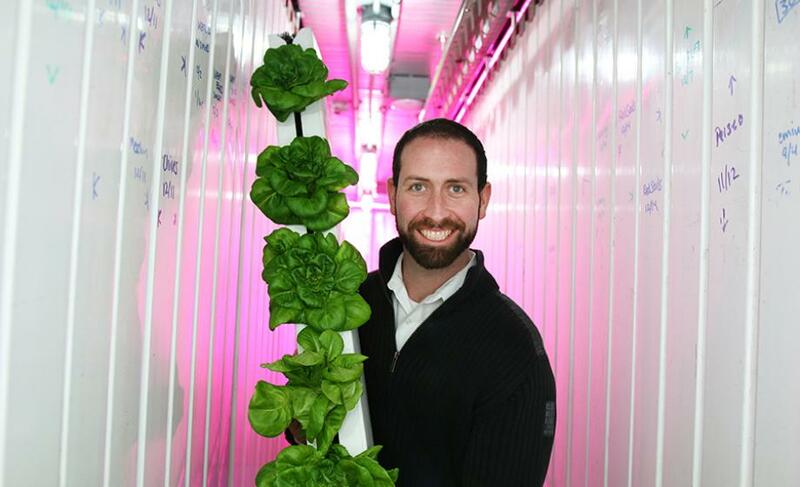 (ES&P) ’13, incubated and launched Freight Farms while still a graduate student at Clark. With early support and guidance from Director of Sustainability Jenny Isler, he and partner Jon Friedman developed a prototype in the Maywood Street parking lot behind the Recycling Center. Few at the time knew the two men entering and exiting the nondescript trailer were creating a model for automated agriculture that would allow people to grow fresh vegetables and herbs in places where traditional farming is not feasible, like business settings, university campuses and especially urban neighborhoods where access to healthy food can be severely limited. 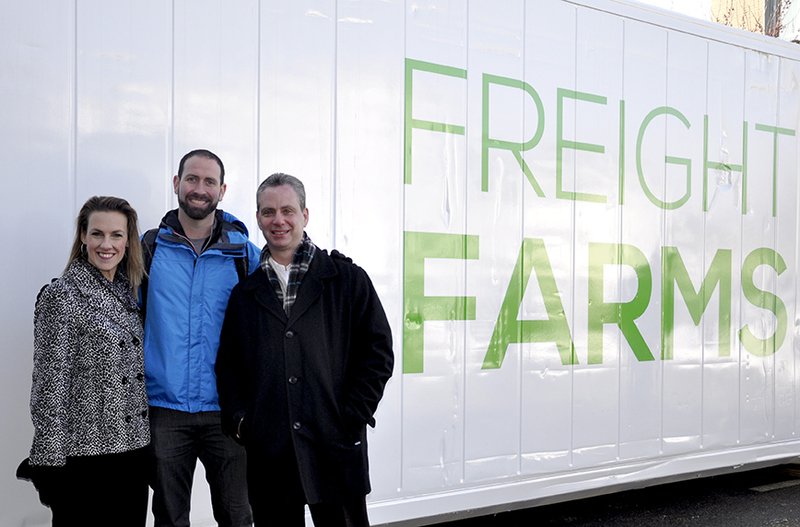 Bringing the Freight Farm to Clark was a collaborative effort between the University and its food service vendor, Sodexo. Heather Vaillette, district manager for Sodexo Campus Services, saw the potential for Freight Farms when it was still in the prototype phase. Sodexo is supporting the project both in funding and execution, Vaillette notes. Team members worked for several months to ensure the Freight Farm met safety standards, and met with McNamara and his staff on logistics. Clark is leasing the Freight Farm for eight months, at which time it will be determined if it is cost-neutral or a savings for the University. While Dining Services initially will be employing its Leafy Green Machine to grow only lettuce, about the most widely consumed vegetable at Clark, eventually it will incorporate other plants. Options can include leafy greens like kale, cabbage and Swiss chard; and herbs like mint, basil and oregano. Down the road, Wykes says, the Freight Farm can be used as a tool for Clark students to learn about such things as sustainable growing and food sourcing.